Anterior Cruciate Ligament (ACL) reconstruction is the sixth most common procedure in orthopaedic surgery. Almost 100.000 ACL repair procedures are performed annually in the USA alone. Although widely investigated, ACL reconstruction still continues to evolve with various technical issues under debate. These include proper tunnel placement, the use of single or double bundle technique, the type of fixation as well as the selection of the graft . The most common autografts currently used are bone-patellar tendon-bone and hamstrings tendon, and, less commonly, the quadriceps tendon. A recent Cochrane trial comparing BPTB and hamstrings tendon repairs outcomes was inconclusive . In 1988 Friedman pioneered the use of an arthroscopically assisted four stranded hamstring graft technique . Since the early 90s, enlargement of bone tunnels after anterior cruciate ligament reconstructions has been well-documented. For ACL reconstructions using hamstrings, the incidence of enlargement varies between 11% and 47% . Hamstrings autografts have relatively low donor site morbidity, the dimensions of the graft are closer to the intact ACL and the ultimate strength is as high as 4090 N [5, 6]. On the other hand, there is still concern about the graft healing within the osseous tunnels. Although many studies report bone tunnel enlargement after ACL reconstruction, none proved to be clinically significant or related to inferior clinical results or higher failure rates [7-10]. Concerns only exist in cases where a surgical reoperation is necessary. Routine diagnostic arthroscopy was performed on all patients initially. A double looped semitendinosus and gracilis tendon autograft was used. The tibial tunnel was created at the center of the footprint and reamed first while the femur was reamed either transtibially or via AM portal trying to put the tunnels as anatomically as possible. The positioning of the femoral tunnel is the primary factor for graft isometry . The positioning of the tibial tunnel is the primary factor ressible for the impingement of the graft against the roof of the intercondylar roof . The guide pin was inserted approximately 2-2.5 cm medial to the tibial tuberosity to approximately 6-8 mm anterior to the posterior cruciate ligament with an angle of 55o-65o with respect to the medial joint line of the tibia. After the tibial tunnel was rasped, the femoral guide pin was inserted using the femoral offset guide which was selected according to the graft thickness, preserving 1.5-2.0 mm thickness of the posterior femoral cortex. In the first group (Group A), a suspensory femoral graft fixation with RetroButton (Arthrex, Inc, Naples, Fl.) device was used in 43 patients (31 males and 12 females) (Fig. 1). In the second group (Group B), the Bio-TransFix device (Arthrex, Inc, Naples, Fl.) was used for transcondular femoral fixation in 30 patients (22 males and 8 females) (Fig. 2). The third group (Group C) included 25 patients (20 men and 5 women) and an aperture fixation with the AperFix device (Cayenne Medical, Scottdale, Ar, Zimmer, Biomet) was used (Fig. 3). In groups A and B a bioabsorbable screw and a post tie with u staple was used for the tibial graft fixation. In group C a non absorbable PEEK (polyetheretherketone) polymer sheath-screw implant was used for tibial sided fixation (Table 1). Table 1. Demographic data of the three groups. Table 3. Tunnel widening in femur and tibia at 6 months, 1-year and 2-year follow up. Coronal plane. Table 4. Tunnel widening in femur and tibia at 6 months, 1-year and 2-year follow up. Sagittal plane. Table 5. Graft failures-meniscal lesions. Anterior cruciate ligament tear is a detrimental event for any patient, and appropriate management is important in order to ensure return to pre-injury activity but also to prevent long-term complications due to the knee injury. Surgical management of ACL tear appears to be the answer in patients who wish to restore their pre-injury activity level [3, 5, 6, 13-17]. Hamstring tendons are being used increasingly in anterior cruciate ligament reconstruction claiming lower harvest-site morbidity when compared with patellar tendon grafts [18, 19]. It has been shown that a 4-stranded hamstring tendon graft is stronger than the BPTB graft , but the weakest point in hamstring tendon ACL reconstruction is not the graft itself but the fixation sites. In MRI observation of the patients’ postoperative condition, a normal ACL graft should have low signal intensity on short TE sequences [7, 20-22]. Intermediate signal was often seen at approximately 4 to 8 months postoperatively, decreasing with time and usually completely resolving by 12 months . This increased signal is thought to be due to graft revascularization and ligamentization [23, 24]. Because the doubled semitendinosus and gracilis tendon graft is composed of four separate strands, intermediate signal and even fluid can normally be seen between the strands of the graft of T2-weighted sequences. This normal intermediate signal is always oriented along the fibers of the graft as opposed to a tear, which is perpendicular to the graft. A helpful feature distinguishing revascularization of the graft from disruption is the lack of concomitant secondary signs of rupture, such as anterior tibial translation and uncovering of the posterior horn of the meniscus. ACL fixation methods have improved significantly over the past decade. Currently a variety of fixation techniques are available allowing for early return of neuromuscular function. After arthroscopic ACL reconstruction, the autograft used to replace the ruptured ligament undergoes a biological healing process consisting of four phases: initial necrosis, revascularization, cellular repopulation and remodeling [25-28]. Graft fixation has not only to withstand the physiological forces but also to facilitate the biological incorporation of the graft construct. Among the related complications, tunnel elongation has been reported regardless of the technique used [17, 26]. Tunnel widening seen after anterior cruciate ligament reconstruction has been the topic of several reports since the 1990s [8, 9, 19, 29, 30] Tunnel widening occurs mainly during the first 6 months after surgery, while the process of maturation (ligamentization) may continue for more than a year [27, 28, 31]. The aetiology of this enlargement is multifactorial, including both mechanical and biological factors. Mechanical factors include micro motion of the graft in the tunnels, inappropriate positioning, bone necrosis during drilling as well as aggressive rehabilitation programs. Biological factors include bone resorption, graft edema, tunnel synovial fluid infiltration, and increased cytokine concentration (IL-6 & TNF-alpha). Hoher et al. showed that graft tunnel motion can be 2 to 3mm even during physiologic loads when suspensory fixation (endobutton) was used. Results are conflicting as to whether or not rigid fixation of the graft close to the joint, known as aperture fixation, can decrease graft-tunnel motion and possibly tunnel widening [4, 32-34]. In porcine femora, the interference screws and the Rigidfix fixation demonsrated inferior fixation biomechanics compared with Bio-Transfix (Arthrex, Inc, Naples, Fl.) and EndoButton techniques . Transcondylar femoral cross-pin fixation was described by Clark, et al. . They showed that biomechanical properties were superior to other femoral fixation devices in hamstring ACL surgery, although Rose, et al. confute their hypothesis that the trasfixation technique leads to less laxity and therefore to a better clinical outcome when compared with the use of bioabsorbable screws. According to a recent study by Lopes et al., greater enlargment of the femoral bone tunnel was observed when a bioabsorbable trans-tunnel pin system was used with medial portal technique, compared to extracortical fixation . Will a shorter graft and more rigid graft complex fixation produce less tunnel enlargement? The most optimal fixation method has not yet been defined. In the present study, different fixation techniques were compared. No statistically significant differences between the fixation methods were observed except tunnel enlargement at the coronal plane at the femoral side in group A (RetroButton). There were no significant differences between the groups either with respect to the various knee scores (Lysholm, Tegner, IKDC) or with respect to KT 1000 arthrometer evaluation results. The goal of the present study was to evaluate different fixation devices, to compare the expected development of tunnel widening when using hamstring autografts and if there is any impact or clinical implication and finally to report the results at 6 months, 1 and 2 years after surgery. We hypothesized that all 3 techniques provide equal results in restoring knee stability. This study showed that more rigid fixation techniques lead to less femoral tunnel enlargement but do not lead to significant differences with respect to Lysholm, Tegner, IKDC scores or arthrometric evaluation results. It is important to evaluate the performance of these fixation methods in prospective randomized studies comparing them with standard methods. According to our study, all three techniques yielded satisfactory results in almost 90% of patients in all groups. We concluded that the position of the fixation sites and type of fixation device are contributing, but are not the only factors responsible for development of tunnel widening after ACL surgery. As other authors have reported [8, 9, 29, 30, 34], we did not find a significant correlation between tunnel widening and clinical outcome. This could be because TW is without implications for the clinical situation or a difference did not emerge because of a small number of patients. 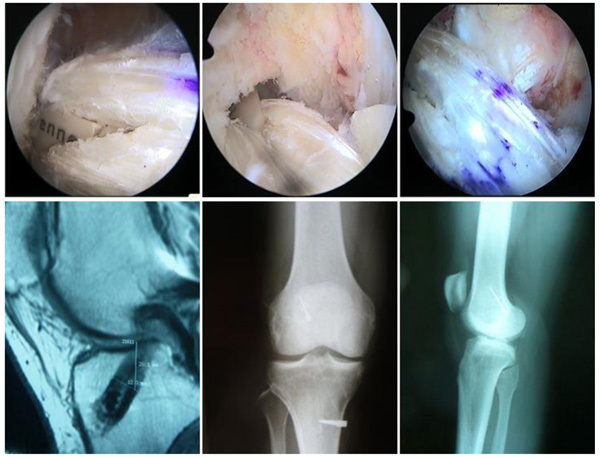 On the other hand, we also believe that all fixation techniques should be designed in a manner that will reduce the incidence of TW as much as possible, because it is clear that a wide bone tunnel filled with fibrous tissue can potentially complicate a later revision ACL procedure. We have not been able to establish any superiority of one fixation technique over the other, because they all have similar results and overall patient satisfaction was more than 89%. 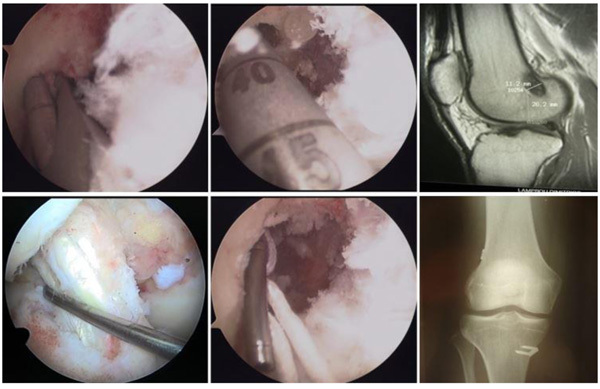 Prodromos CC, Fu FH, Howell SM, Johnson DH, Lawhorn K. Controversies in soft-tissue anterior cruciate ligament reconstruction: Grafts, bundles, tunnels, fixation, and harvest. J Am Acad Orthop Surg 2008; 16(7): 376-84. Mohtadi NG, Chan DS, Dainty KN, Whelan DB. Patellar tendon versus hamstring tendon autograft for anterior cruciate ligament rupture in adults. Cochrane Database Syst Rev 2011; 7(9): CD005960. Friedman MJ. Arthroscopic semitendinosus (gracilis) reconstruction for anterior cruciate ligament deficiency. Tech Orthop 1988; 2(4): 74-80. Clatworthy MG, Annear P, Bulow JU, Bartlett RJ. Tunnel widening in anterior cruciate ligament reconstruction: A prospective evaluation of hamstring and patella tendon grafts. Knee Surg Sports Traumatol Arthrosc 1999; 7(3): 138-45. Jansson KA, Linko E, Sandelin J, Harilainen A. A prospective randomized study of patellar versus hamstring tendon autografts for anterior cruciate ligament reconstruction. Am J Sports Med 2003; 31(1): 12-8. Prodromos CC, Han YS, Keller BL, Bolyard RJ. Stability results of hamstring anterior cruciate ligament reconstruction at 2- to 8-year follow-up. Arthroscopy 2005; 21(2): 138-46. Barber FA, Spruill B, Sheluga M. The effect of outlet fixation on tunnel widening. Arthroscopy 2003; 19(5): 485-92. Segawa H, Omori G, Tomita S, Koga Y. Bone tunnel enlargement after anterior cruciate ligament reconstruction using hamstring tendons. Knee Surg Sports Traumatol Arthrosc 2001; 9(4): 206-10. Simonian PT, Erickson MS, Larson RV, O’kane JW. Tunnel expansion after hamstring anterior cruciate ligament reconstruction with 1-incision EndoButton femoral fixation. Arthroscopy 2000; 16(7): 707-14. Höher J, Möller HD, Fu FH. Bone tunnel enlargement after anterior cruciate ligament reconstruction: Fact or fiction? Knee Surg Sports Traumatol Arthrosc 1998; 6(4): 231-40. Sanders TG. MR imaging of postoperative ligaments of the knee. Semin Musculoskelet Radiol 2002; 6(1): 19-33. Howell SM, Clark JA. Tibial tunnel placement in anterior cruciate ligament reconstructions and graft impingement. Clin Orthop Relat Res 1992; 283(283): 187-95. Clark R, Olsen RE, Larson BJ, Goble EM, Farrer RP. Cross-pin femoral fixation: A new technique for hamstring anterior cruciate ligament reconstruction of the knee. Arthroscopy 1998; 14(3): 258-67. Goradia VK, Grana WA. A comparison of outcomes at 2 to 6 years after acute and chronic anterior cruciate ligament reconstructions using hamstring tendon grafts. Arthroscopy 2001; 17(4): 383-92. Wagner M, Kääb MJ, Schallock J, Haas NP, Weiler A. Hamstring tendon versus patellar tendon anterior cruciate ligament reconstruction using biodegradable interference fit fixation: a prospective matched-group analysis. Am J Sports Med 2005; 33(9): 1327-36. Paessler HH, Mastrokalos DS. Anterior cruciate ligament reconstruction using semitendinosus and gracilis tendons, bone patellar tendon, or quadriceps tendon-graft with press-fit fixation without hardware. A new and innovative procedure. Orthop Clin North Am 2003; 34(1): 49-64. Freedman KB, D’Amato MJ, Nedeff DD, Kaz A, Bach BR Jr. Arthroscopic anterior cruciate ligament reconstruction: a metaanalysis comparing patellar tendon and hamstring tendon autografts. Am J Sports Med 2003; 31(1): 2-11. Konan S, Haddad FS. The unpredictable material properties of bioabsorbable PLC interference screws and their adverse effects in ACL reconstruction surgery. Knee Surg Sports Traumatol Arthrosc 2009; 17(3): 293-7. Recht MP, Kramer J. MR imaging of the postoperative knee: A pictorial essay. Radiographics 2002; 22(4): 765-74. Ahn JH, Lee SH, Choi SH, Lim TK. Magnetic resonance imaging evaluation of anterior cruciate ligament reconstruction using quadrupled hamstring tendon autografts: Comparison of remnant bundle preservation and standard technique. Am J Sports Med 2010; 38(9): 1768-77. Howell SM, Clark JA, Blasier RD. Serial magnetic resonance imaging of hamstrings anterior cruciate ligament autografts during the first year of implantation. Am J Sports Med 1991; 19(1): 42-7. Roberts CC, Towers JD, Spangehl MJ, Carrino JA, Morrison WB. Advanced MR imaging of the cruciate ligaments. Radiol Clin North Am 2007; 45(6): 1003-1016, vi-vii. Waltz RA, Solomon DJ, Provencher MT. A radiographic. assessment of failed anterior cruciate ligament: Can magnetic resonance imaging predict graft integrity? Am J Sports Med 2014; 42(7): 1652-60. Amiel D, Kleiner JB, Roux RD, Harwood FL, Akeson WH. The phenomenon of “ligamentization”: Anterior cruciate ligament reconstruction with autogenous patellar tendon. J Orthop Res 1986; 4(2): 162-72. Arnoczky SP, Tarvin GB, Marshall JL. Anterior cruciate ligament replacement using patellar tendon. An evaluation of graft revascularization in the dog. J Bone Joint Surg Am 1982; 64(2): 217-24. Ekdahl M, Wang JH, Ronga M, Fu FH. Graft healing in anterior cruciate ligament reconstruction. Knee Surg Sports Traumatol Arthrosc 2008; 16(10): 935-47. Falconiero RP, DiStefano VJ, Cook TM. Revascularization and ligamentization of autogenous anterior cruciate ligament grafts in humans. Arthroscopy 1998; 14(2): 197-205. Baumfeld JA, Diduch DR, Rubino LJ, et al. Tunnel widening following anterior cruciate ligament reconstruction using hamstring autograft: A comparison between double cross-pin and suspensory graft fixation. Knee Surg Sports Traumatol Arthrosc 2008; 16(12): 1108-13. Sakai H, Yajima H, Hiraoka H, et al. The influence of tibial fixation on tunnel enlargement after hamstring tendon anterior cruciate ligament reconstruction. Knee Surg Sports Traumatol Arthrosc 2004; 12(5): 364-70. Unterhauser FN, Bail HJ, Höher J, Haas NP, Weiler A. Endoliga- mentous revascularization of an anterior cruciate ligament graft. Clin Orthop Relat Res 2003; (414): 276-88. Buelow JU, Siebold R, Ellermann A. A prospective evaluation of tunnel enlargement in anterior cruciate ligament reconstruction with hamstrings: Extracortical versus anatomical fixation. Knee Surg Sports Traumatol Arthrosc 2002; 10(2): 80-5. Ma CB, Francis K, Towers J, Irrgang J, Fu FH, Harner CH. Hamstring anterior cruciate ligament reconstruction: A comparison of bio- absorbable interference screw and endobutton-post fixation. Arthro- scopy 2004; 20(2): 122-8. Simonian PT, Monson JT, Larson RV. 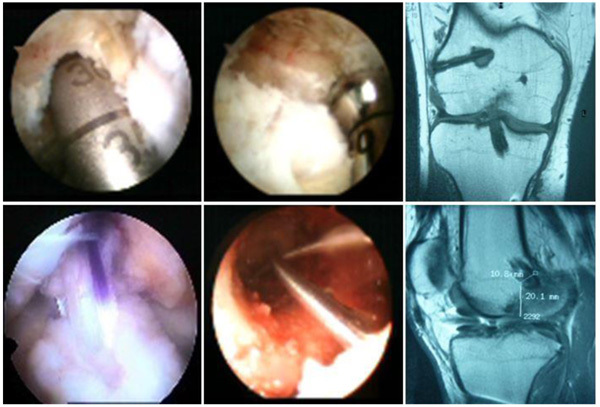 Biodegradable interference screw augmentation reduces tunnel expansion after ACL reconstruction. Am J Knee Surg 2001; 14(2): 104-8. Ahmad CS, Gardner TR, Groh M, Arnouk J, Levine WN. Mechanical properties of soft tissue femoral fixation devices for anterior cruciate ligament reconstruction. Am J Sports Med 2004; 32(3): 635-40. Rose T, Hepp P, Venus J, Stockmar C, Josten C, Lill H. Prospective randomized clinical comparison of femoral transfixation versus bioscrew fixation in hamstring tendon ACL reconstruction a preliminary report. Knee Surg Sports Traumatol Arthrosc 2006; 14(8): 730-8. Lopes OV Jr, de Freitas Spinelli L, Leite LHC, Buzzeto BQ, Saggin PRF, Kuhn A. Femoral tunnel enlargement after anterior cruciate ligament reconstruction using RigidFix compared with extracortical fixation. Knee Surg Sports Traumatol Arthrosc 2017; 25(5): 1591-7.